Every year in August I wait for a sign that the September 11th anniversary of my brother Aaron’s death is approaching. This year it was at a souvenir store in Rhode Island, where amidst lobster trays and anchor pillows I saw a rack of Christmas tree ornaments that included a 9-11-01 ornament. It was a sort of drag queen bald eagle with luxuriously golden wings folded into a heart-shape, penciled eyebrows, squeezed into a cuirass of a Captain America-type shield and perched atop a scroll with that indelible date. A bewildering sight to me…I wondered what this thing meant to people who had no personal connection to the lives lost that day? And why Christmas? According to the manufacturer’s website, “Old World Christmas glass Remembrance ornaments were designed to honor the thousands of lives lost on September 11, 2011, and keep their memory alive.” That is a worthy goal, but for me seeing this ornament was one small example of how American culture seeks to make the lives lost on September 11th into a beautiful scar on the American body: something suitable to be depicted on a ribbon-shaped magnet, but also to be flexed in public to justify any paranoid or violent urge our leaders and fellow citizens might indulge. I have a lot of anger about how the memory of Aaron and the others who died that day is deployed in American culture and politics. This is something I talked about last year with Colby, a Hampshire College student whose senior project included interviews with me and other 9-11 family members. All of this public wrestling is very far from the personal loss my family and I bear from missing Aaron, who was no hero, just someone at work; representing only his own life and its connections to many who loved him, and not anyone else’s idea of what America means or how it relates to the world. It was with this perspective that I tried to write a poem about this ornament from the perspective of a shop-owner who would display it. I tried not to bring too much of my personal anger and elitist cattiness to bear on this persona, because I am a nice person. But I wanted to push this character into extreme displays of what I imagine as a strongly-felt but inchoate set of emotions that give rise to this kind of ornament. My favorite part of it is evoking the Latin phrase from Horace, “dulce et decorum est pro patria mori.” This literally means something like “It is sweet and proper to die for your country,” and was famously rebuked in Wilfred Owen’s First World War poem, “Dulce et Decorum Est.” If I am not the first person to make this translation of “decorum” into “decorative,” don’t tell me! I also was delighted to put ‘ol baldy into the heraldry context with his self-sacrificing friend the pelican. But really this is a trivial poem. The tougher question I found myself asking was, why, in this grief/history-induced creative work I’ve done at this time of year the past few years, do I end up writing myself inside the weird confines of such poetic vehicles as a Christmas ornament, a memorial candle, or even an imagined mezzanine of the WTC itself? And why is it that I rarely write poetry except at this In Memoriam season, or indeed much of anything (well I did put my heart and soul into an Adrienne Rich/Claudia Rankine piece this winter), now that the whole blogging moment is past? I’ve been reading Dante’s Inferno (translated by Robert Pinsky) and Seamus Heaney’s long poem “Station Island,” which uses Dante’s rhyme scheme and also stages various encounters between Heaney and the dead in a pilgrimage setting. Inspired or egged on by these masters, I permitted myself to imagine encountering Aaron in the “space” of my poetry and my struggles to write in the wake of his loss. The “workshop” I write myself and him into is the hardest place I’ve ever had to go as a writer, and I was grateful for the sense of release and freedom to write joyfully that I found there. I also made myself cry reading in “Aaron’s” voice which probably means I’m on the right track. Of course part of the poem’s point is that I have only been writing on this most grim of deadlines (mostly) and that the Poet Josh self that Aaron knew was someone who would be writing all the time. Hopefully this confrontation I’ve conjured will slap some more urgency into me. And if you are reading this thinking of Aaron, me and my family, thank you. With annals from the Roman-numeraled year. Of bric-a-brac. A candle glass? “Prezi”? Fill up that space like a good-natured slap. Josh, thank you for sharing these thoughts and feelings with us, and giving us a window into the pain of missing Aaron every day that you experience. I loved the way you crafted this blog entry, having been there with you through some of these moments. I love you, and I love Aaron, and wish he was here with us in person. May this new year bring more writing for you. Josh, how wonderful that you grab Aaron back from bare and bleak thoughts and put flesh on the bones of your boys’ friendship down the years. I am, at least, grateful that you have a well of good moments shared to refresh yourself by. 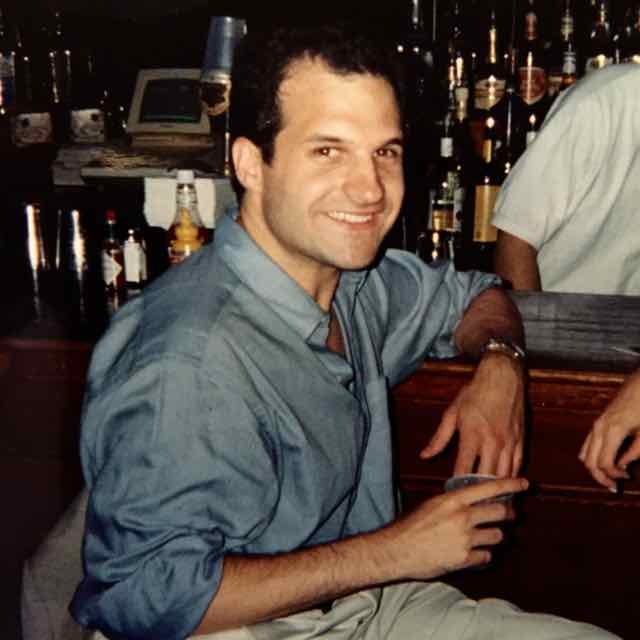 I picture you guys meeting up at sports bars in Manhattan to mull over the absurdities of the week on Wall Street and in the Ph.D. mills, I see Aaron’s face cracking up in his beaming smile. You two knew how to make each other laugh in a very special way – he will always be your younger brother. When I played golf this summer I used his advice to stop waggling around too much. He is always with us.